Cameron drifted into the wrong lane, then came to the wrong border post — and just like that the Connecticut-plated BMW was under suspicion as a drug runner. We were asked to await a drive-through X-raying, then wedged between a body-rotted pickup truck and a minivan whose rear panel was being sniffed by a rangy German shepherd. 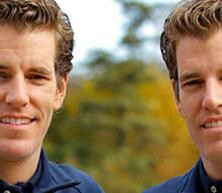 — Yes, why wouldn’t Awl pal Dana Vachon go on a roadtrip to Mexico with the Winklevoss brothers?